Many of Zoulou’s crew, including Marseille resident Thierry Fouchier, competed here at the America’s Cup World Series event two years ago aboard Franck Cammas’ Team France. “It is a very nice place to sail. We were here two years ago and it was a bit lighter, but we trained before in a strong Mistral wind,” continued le Breton. 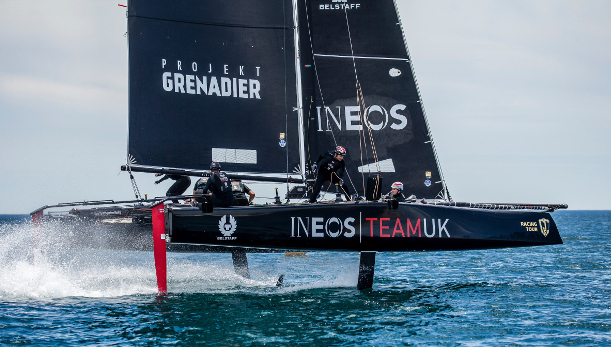 The GC32 Racing Tour has an impressive array of international teams including the USA’s Argo, present leader of the 2018 Owner-Driver ranking, Simon Hull’s Frank Racing from New Zealand holding sixth overall and Simon Delzoppo’s .film Racing from Australia in seventh. Competing on .film Racing is an international crew comprising one Swede, an Englishman and an Irishman, and French former America’s Cup skipper, Sébastien Col. So how is it sailing on an Australian boat? “It is good,” says Col. “I have always been attracted by sailing with different people and different nationalities and different kinds of boats. Sailing with the Australians has been about getting used to the accent and the jokes!” Three of the .film Racing crew, including Col, last year sailed on Malizia-Yacht Club de Monaco, skippered by Princess Caroline of Monaco’s youngest son Pierre Casiraghi.